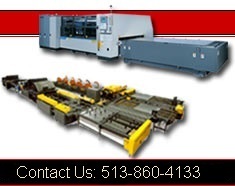 Betenbender |Betenbender Sheet Metal Fabricating Machinery | Betenbender Shears and Brakes | Cincinnati Precision Machinery, Inc. If you're not already a customer of Betenbender Manufacturing, Inc., we welcome you as a future owner of an American made Betenbender Shear or Betenbender Press Brake. If you've bought one before, we welcome you back. Betenbender is proud of the fact that our customers come back again and again as they grow and need more sheet metal bending or shearing equipment. In addition to a full range of Betenbender Hydraulic Shears and Betenbender Hydraulic Press Brakes -- all easy to operate and engineered for simplicity, Betenbender has national and international sales and service team ready to serve you. Betenbender is now celebrating 34 years in business, we have continually updated our designs and metal fabrication equipment to meet our customers' needs.